Total Immersion & ASA Instructors of Tri N Swim W.E.L.L will spend an hour group session with you and the other course attendees reviewing how to improve your balance and streamlining in the water to make you faster and more efficient at freestyle. The workshop will include video examples of fishlike swimmers and “human swimmers” to highlight the major differences. There will be land rehearsals where you will learn how to connect your core with your arms and legs and inject power into your stroke by using whole body movements. Chartered physiotherapist and Retul bike fitter Bianca Broadbent of Fit your bike regularly works with high profile cyclists and athletes at the University of Birmingham. 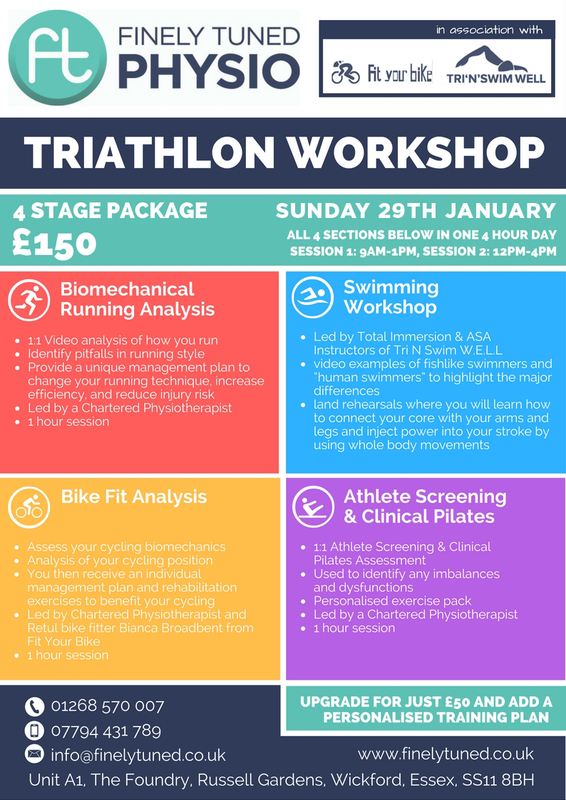 She will spend an hour one-to-one session with you using her bespoke skills to assess your cycling specific biomechanics, and complete a basic analysis of your cycling position. From this she will formulate an individualised management plan, and provide you with specific rehabilitation exercises to benefit your cycling. Chartered Physiotherapist Gemma Tune of Finely Tuned Physio has 10 years’ experience working with sports people of all levels: from recreational runners to Olympic athletes. She has also completed extended training in running technique and analysis. Gemma will spend an hour one-to-one session with you analysing your running biomechanics and identifying pitfalls. She will provide you with a unique management plan to change your running technique, increase efficiency and reduce injury risk. Chartered Physiotherapist & Clinical Pilates Instructor Anna Meggitt of Finely Tuned Physio will spend an hour one-to-one session with you. In the session, she will review your medical and sporting history and your future goals, before going on to assess your posture, range of movement, movement patterns, muscle strength, and muscle length. Once your individual dysfunctions and muscle imbalances have been identified, Anna will build you a Pilates-based exercise programme tailored to your specific needs.